Review of Sara Beaman’s Fluid Transitions: Drills and Combinations for Fusion Bellydance – A t i s h e h. Dance. Fitness. Joy. If you’ve been dancing for a while you know: the right teacher is not necessarily the one who’s the most famous, the most experienced, or even, frankly, the best dancer. Often, it’s the person who can communicate to you in a way that makes sense to your brain and ultimately your body. This is important in live instruction, but essential when it comes to DVDs, where you can’t ask the teacher any questions, and she can’t respond to the way you learn. This is why I get excited — really excited — when I see instructional DVDs that are crafted to work for different kinds of learners, that are more than just, “You do this, then you do this.” One of the exciting things about being a consumer of bellydance videos over the past decade has been seeing how creative producers get, with practice flows, the smart chaptering, innovative material and drills, you name it. So, guess what? I was excited to work with my review copy of Sara Beaman’s Fluid Transitions: Drills and Combinations for Fusion Bellydance. From the first moment I thought, “Oh, she’s thought about this. She’s thought about how to make this usable and easy to learn from.” And my first impression was not wrong. The focus of Fluid Transitions is pretty clear from the title, but it’s probably worth mentioning that Beaman does not give any theory or tips on transitions separately from the drills. The idea behind the program is to achieve fluidity by doing careful drills of combinations at multiple speeds. The DVD is aimed towards intermediate or advanced dancers — definitely not beginners! — and if you are one of these dancers chances are that you can take the tools Beaman gives you and apply them to whatever combinations you’re working on. Warm Up of approximately 10 min. This is based on dynamic stretches and some shimmying, it starts up the muscles and joints you need to move, but it doesn’t get you really warm. I think it wouldn’t be a bad idea to do a little something extra to get the heart rate up too. Isolation Drills, about 16 min. 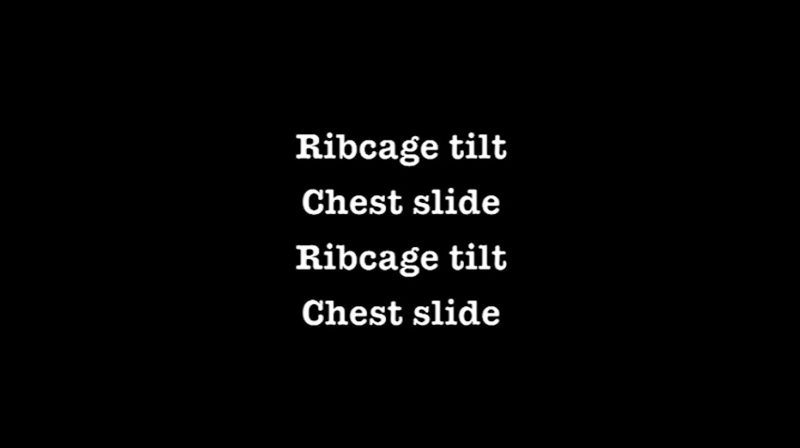 You can play this section right through, or choose single drills from a menu. Here, Beaman quickly but precisely covers the movements she’ll be using in the later combos. The drilling is brief — this is not mean to teach beginners how to do the moves, but to remind you of the correct executions of moves you already know. That said, Beaman also gives little tips on form. Here’s one of the neat things about the DVD: each move is preceded by a screen that shows a written breakdown of the move. Being someone who learns best by reading, I loved this decision. It lets me internalise the idea visually, before I hear the oral breakdown and see how it’s done. This is followed by a brief, about 6 min, Isolation Practice Flow. You basically do the isolations, but all together. I think this part is great, as it gets you into the feeling of moving and putting isolations together. Now we get into the meat. The first combination section contains combos 1 through 4 (about 30 min). Each combination has that great screen before it, quickly explaining what will come up. Then Beaman breaks it down veeeery slowly. As far as I could tell, for every single combo in the program, Beaman is equally thorough in breaking down and drilling both sides. It’s not only great to have both sides worked out equally, but I found that sometimes I will “get” a movement on one side faster than the other, so I’m glad to have both sides instructed too. The combos themselves are quite short and focused on linking together moves using the torso, hips, abs, and arms. There are no traveling steps. These are small units you then drill like crazy to get your body moving smoothly from one kind of isolation to another. In some cases, Beaman will present an easier version and a tougher version of a combo — and then she has you drill both. Just in case that wasn’t enough, she then has you drill the combos at three different speeds. Often, she will have you drill something at half time and at full time for each of the three speeds, which means you’re actually drilling at six different speeds! All of the speeds and instructions segments are chaptered, so you can easily repeat, and they’re in the menus, so you can go directly where you like. Needless to say, what this does to your body feels pretty wonderful. As much as it’s challenging for the brain to follow along, it’s such a fabulous, careful, thorough way of getting moves into your body. Even on the first play of the DVD, I was starting to “get” some of the combinations quite smoothly. I stopped and went to a mirror to practice sometimes, I did my own stretches in between the sections, but it all worked. It felt good. And I think doing the three speeds is brilliant, because while my first challenge was getting a combo down, my second was doing it slowly. Doing a combination slowly but still evenly and smoothly is harder than doing it fast, and a great way to pay attention to what the muscles are doing and to each component of the movement. Then things get even more interesting. Beaman takes apart combos 1 and 2, and puts them together into one longer combo. Same for 3 and 4. And you drill those. Here’s what I loved about this. While she doesn’t say it in so many words, she’s really teaching you how to get smooth transitions in your own movement. You break it down into the smallest possible combinations, drill those like crazy, then combine them in creative ways, and drill those together. The next section features combos 5 and 6 (about 17 min), and these work a little differently. These are layering combinations, and what Beaman eventually has you do is to do one of the layers, then all of the layers together, then another of the layers alone, then all together, and so on. What part of my brain was still working at this point was fried by these drills, but I also found them really cool. It’s basically a pattern for creating movement that’s interesting to the eye, adding and subtracting layers in turn. Finally, you have a satisfying Cool Down that stretches everything out from a standing position. It’s about 6 minutes long, so I added some of my own stretches too. The menus are really smart, really detailed. I love this, I love it when a producer really thinks about how to make the work usable. Moreover, in a separate section Beaman has four practices set up ranging from 23 to 32 minutes, each of which begins with the warm up, takes you through some of the combos, and ends with the cool down. Fluid Transitions really, really, badly made me want to do more tribal fusion. But I don’t think you have to be a tribal dancer to get a lot out of it. This morning I was already thinking about how some of the combos could be modified — with something as simple as a heel up, for example — to give them a more raks sharki feeling. One thing I can’t judge however is how much of the material or method would be new to dancers already steeped in TF. Who wouldn’t like it? Well, if you’re a beginner, you might find it moves too fast for you. Also, if you’re looking for transitions between traveling moves, you’ll find nothing here. That said, there’s a lot to grow with Fluid Transitions. She gives some tips at the beginning for how to modify or add to the drills. But the real point is, this DVD doesn’t just teach you to string together a few moves, it teaches you how to think about putting moves together and then drilling them. You learn to take out an element from an isolation to make it work with another move, you learn to take combinations apart and put them together in creative ways, and you learn how to play with layers to make cool-looking dance. What’s not to love about that? Fluid Transitions is available as a print-on-demand DVD from Amazon. It worked flawlessly on my MacBook Pro.